Coconuts are responsible for giving us a lot of great things, like coconut water, coconut milk, and best of all: piña coladas—but nothing is as useful and beneficial to us as coconut oil. At room temperature coconut oil takes on a solid form, but once a few degrees are added—as when it comes in contact with your body heat—it melts into a liquid, making it the perfect consistency for a hydrating moisturizer. 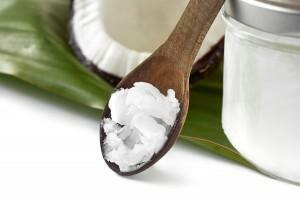 Coconut oil is an antioxidant that also has antifungal, antibacterial and antimicrobial properties. This means that coconut oil not only moisturizers your skin, but also cleans it. When the oil comes into contact with your skin, it wipes away dead skin cells, dirt, and bacteria, forming a protective layer that continues to fight away unwanted free radicals. These dirt-fighting properties are also what allow coconut oil to be used as an effective make-up remover. Additionally, coconut oil contains Vitamin E—an ingredient present in many skin-care products—giving it protective, healing properties that make it perfect to use as an anti-aging and wrinkle-smoothening moisturizer. The composition of coconut oil (to get technical, it’s a medium-chain fatty acid, which makes it a good energy producer) allows for quick digestion and deep penetration. This makes it an effective moisturizer for flaky, rough, dry, and cracked skin. If you have any tricky areas, like rough elbows, cracked heels, or dry lips, coconut oil’s natural properties make it safe to use anywhere on your body, and don’t worry about getting it in your mouth, because it’s safe (and yummy) to eat too! Like any other good moisturizer, coconut oil also contains SPF (one study found that it has an SPF value of around 8), so it protects you from harmful UV rays that damage and age the skin. 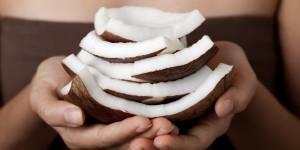 It’s also said that coconut oil helps maintain tans, allowing for a long-lasting tan that keeps your skin glowing. It really seems like there’s nothing coconut oil can’t do—and to top it all off, it will leave you smelling delicious too! Keep in mind though that there is such a thing as too much of a good thing. Coconut oil is long-lasting, and over-application can turn into a problem if you’re trying to get your skin to absorb more than it needs; you’ll be left a bit oily and greasy if you use too much. Now go on out there and get yourself some organic, unrefined coconut oil and be on your way to beautiful, radiant, and healthy skin!